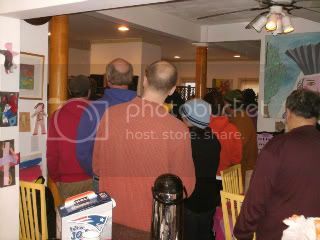 Saturday, December 6, between 30 and 40 people came to a house in Cambridge, MA to do a weatherization barnraising. We began checking in at 8 am to start work at 9. There was a blower door and an infrared camera to test our results. This was part of the public access TV series Energy Smackdown, a competition between different towns to see which can reduce their carbon footprint most. Materials were donated by EFI and Home Depot. Byggmeister donated the blower door and infrared camera and the operator, Kerry Koskinen, volunteered his time. 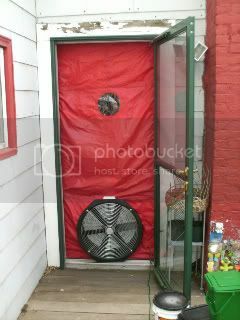 A blower door depressurizes the house by 50 Pascals so that you can see where the air leaks in. You can feel the draft with the back of your hand or see it with a smoke pencil (or a stick of incense or a cigarette). 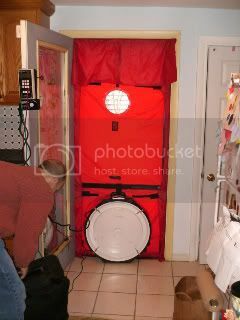 A blower door test costs from $200 to $500 and is well worth it if you are serious about cutting down infiltration. On average, 2 professionals in one day will reduce air leaks by about 250 cfm [cubic feet per minute]. We started at 4500 cfm at 50 pascals and after 3 hours of work and about $500 of materials we ended at 3850 cfm. 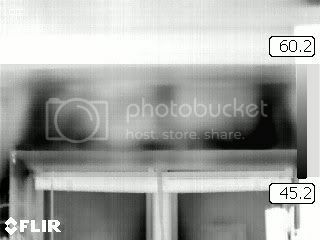 The infrared camera gave us a clear view of where the leaks were. The camera records temperature and you can see heat as the lighter colors and coolth as the darker. The temperature scale is registered on the left of the picture. 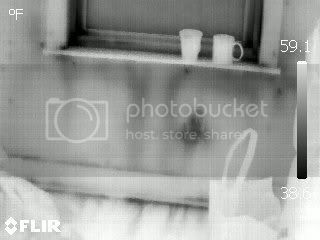 Unfortunately, the battery on the IR camera conked out before Kerry could do the after pictures. 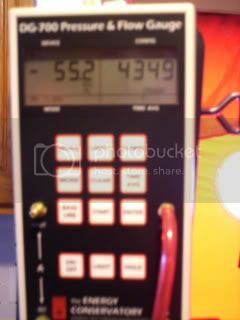 An IR thermometer which costs $70 rather than $7000 for an IR camera will also work but it just ain't as kewl. And there's an infrared "heat seeking ray gun" whose beam changes color in the presence of cooler temperatures that should be available sometime in 2009 for $39.99. 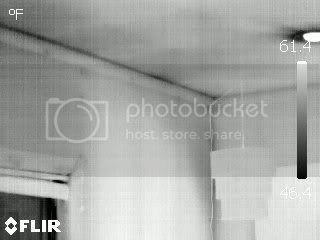 I was working on windows, putting Mortite rope caulk around the window sash. Unfortunately, the windows had plastic cladding and the composition of Mortite has changed since the last time I used it. It wouldn't stick. Very frustrating. I switched to insulated the wall sockets instead. Eventually, we changed to weatherstripping tape, a product I hadn't used before and didn't use that day either as I had a previous engagement and had to leave early. Later reports informed me that most if not all the windows were weatherstripped in record time. With the "blower door" and infra-red camera to guide us, we found that we reduced the air infiltration at Chris and Pam's last weekend by 15%. This will be close to what you can expect in your own home if you decide to weatherize as we all learned to do. That should be worth about $200/year at current fuel prices. We didn't finish insulating the attic hatch which would have reduced the air infiltration even more. This is what the crowd looked like as we gathered for our instructions. A good time was had by all, with the possible exception of the cat who I heard got insulated behind a wall for a day or so. I'd like to see a weatherization barnraising at the White House. Complete with blower door test and infrared camera. I'd like to see President Obama kick off the move to green jobs with a weatherization, insulation, and energy efficiency work day on public buildings. There are plenty of repairs and upgrades for government buildings that provide immediate rewards, saving enough money through lower energy costs to pay back in a couple of years. This is exactly where the green job economy starts. Architecture 2030 has a stimulus plan to create millions of jobs by applying energy efficiency methods to existing buildings that would pay for itself in energy savings within five years. save 83.35 million barrels of oil. I'd like to see President Obama bring weatherization barnraisings to the national level but, even if he doesn't, we'll continue to have weatherization barnraisings in Cambridge. The next barnraising is at a local public school and will have the help of the MIT Sustainability Club, a student group. I can imagine weatherization and, later, solar barnraisings on one school building a month, with energy efficiency training building throughout the community. A consistent program of hands on energy education could be significant. HEET, a Cambridge-based energy efficiency team, is weatherizing the Cambridgeport Public School. We need someone who can install a few photosensors in classrooms and stairways so when it's bright enough from daylight, the lights turn off. The person should be able to teach a few volunteers how to do this work also (safely). The Cambridge public school system needs help decreasing its energy use, so more of its budget goes to teachers and books, than to wasting energy. Help us help them. Thanks for this post. Picked it up via the dailykos/strandedwind update. I'm looking for a job in this area. I reside in Lincoln, NE and have recently graduated from a community college with an AAS in HVAC/R. Congrats on you barnraising ! !